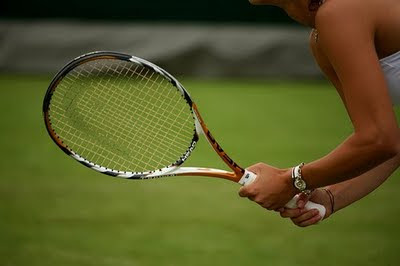 It sounds very simple: you ring a friend, you motivate each other, put on some inspiring tennis clothes, take a racket, balls, water and head off to a court. If one is free – you go ahead and play. If all are busy – you chat and wait for one to open up. But you may want to know how long you can expect to wait. You contemplate sneaking on to each court, maneuvering among 50mph balls, and bugging angry players about when they’ll be done. How else do you know who has been on the court for 2 hours and who has been playing for only 5mins? Shall you put this cup of coffee aside and start warming up or you still have plenty of time to call and line up all the playdates for the upcoming weekend? How do you make court use fair and simple? Hire a court manager? Great, but expensive. A sign-up board? We all know that the chalk gets wet, lost or stolen. Well, here is my town's novel solution to this old waiting problem. Listen carefully: if you find it feasible, you could apply it to any shared resource, such as your home's bathrooms. 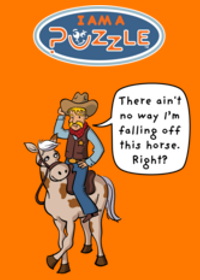 Or, perhaps, you could even suggest and patent a better one. 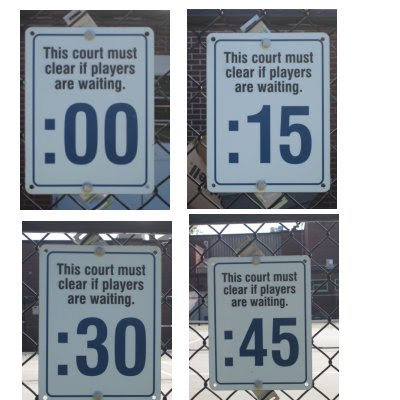 So, this means that if you are playing on a court marked “:00” and someone is waiting, then at the next round hour you need to clear the court. Same for the three other courts, only you have to clear them at 15, 30, 45 minutes past each hour. How exactly does this rule work? If you come at 2pm, play for an hour, undisturbed on the :00 marked court, and then at 3pm have to free the court if anyone is waiting - it all makes great sense. But what if you come at 2.55pm, see the empty court marked ":15" and start playing. Twenty mins. later new players come and reading the rules, demand that you free the court right then, at 3:15pm. According to this rule, you should do it. You, and not the couple at the ":00" marked court who have been playing for over an hour. How is this supposed to be fair and logical? It appears that this tennis court rule is a simple strategy to insure everyone can play for at least an hour and wait no longer than 14 minutes before getting to play. But this “60 min. play / 14 min. wait” outcome only works if everyone understands the math behind the rules and agrees to follow them for the long-term benefit, despite some short-term absurdity. For this “60 min. play /14 min. wait” result to be achieved, newcomers must go to the court corresponding to the next 15 minute mark. So, anyone arriving at 2.55pm should head to the ":00" marked court, even if this court is busy and the other court is empty. This will lead to some waiting time (only up to 14 minutes), but will also allow newcomers to enjoy the whole hour from 3 to 4pm, uninterrupted. It may also make current ":00" players move to any other empty court at 3pm, but assuming that they also followed the rules, they already enjoyed a whole hour of undisturbed playing before that. What do you think of this arrangement? Can we be trusted to read and understand the rules, and choose the appropriate timing strategy for long term gain, despite the obvious occasional short-term absurdity? What strategy do you use on your courts? Catch the question and pass on the answer - the ball is back in your court. This system teaches us that trying to be nice to people by violating rules (taking an empty court instead of asking people to clear the next in line court) not always pays. Indeed, the road to hell is paved with good intentions. I am curious who has made such rules.It is interesting to read such rules and more funnier to follow them. And it would never work in the bathroom at my house! What a clever, clever idea. I think the system would work. People would have to work together and enforce them and be considerate. Occasionally people might need to be a little more assertive though. Very interesting post. Thanks for sharing!